As most Pontiac fans realize, changing rear gear ratios can yield a tremendous performance increase. Three questions sometimes arise when considering a change in rear end ratio: How will the change affect top speed?, How will the change affect fuel economy?, and How will the change affect exhaust emissions? A change in rear gear ratio can be one of the most satisfying modifications you can make on your Pontiac, and it can be one of the most cost effective. For instance, changing from a 2.41:1 ratio to a 3.73:1 ratio will provide a rear wheel torque increase of 55%. Figure I below is a chart of rear wheel torque increases; to find the torque increase for a proposed gear ratio change, find your present ratio in the left column and move across to the column that is headed by the proposed ratio, the percentage shown is the torque increase (negative percentages are torque decreases). Providing you can get it to the ground (have sufficient traction) the 55% torque increase should substantially improve your quarter mile E.T. and push you back in the seat a lot harder! On the street,the drivability and responsiveness will be greatly improved. There are some interesting points to ponder in a rear gear change. For instance, a 1978 Firebird with -the standard 400 (non T/A 6.6) engine originally equipped with 2.41:1 gears. With this combination the torque peak occurs at about 52 mph and the horsepower peak occurs at about 118 mph. The same gear with 3.73:1 gears reaches the torque peak at about 34 mph and the horsepower peaks at about 76 mph. The 3.73 gears convert this car from a "Freeway Cruiser" into a "Surface Street Stomper" that would have tremendous response at around town speeds and would probably get the best fuel economy at city speeds of 30-40 mph. The 3.73:1 gears convert the T/A 6.6 car from a "Freeway Flyer" into a good highway or multipurpose car. On both examples above the cars and gears considered were identical, the only difference was the engine, yet the peaks and most practical uses for each car varied greatly. The point of these examples is that a gear ratio that is perfect for one car could be a disaster in another car aiming for a similar performance goal, so you must consider the engine combination carefully when choosing the rear gear ratio. Another point that became obvious in the first example, is that the non-T/A 6.6 400 is woefully undercammed for high performance use. As you can see from the road horsepower graph (figure 2) below, the maximum vehicle speed is influenced by the rear gear ratio. The graph shows increasing horsepower and torque on the vertical axis and increasing vehicle speed on the horizontal axis. NOTE:	All curves shown in this article are arbitrary but representative of actual relationships. 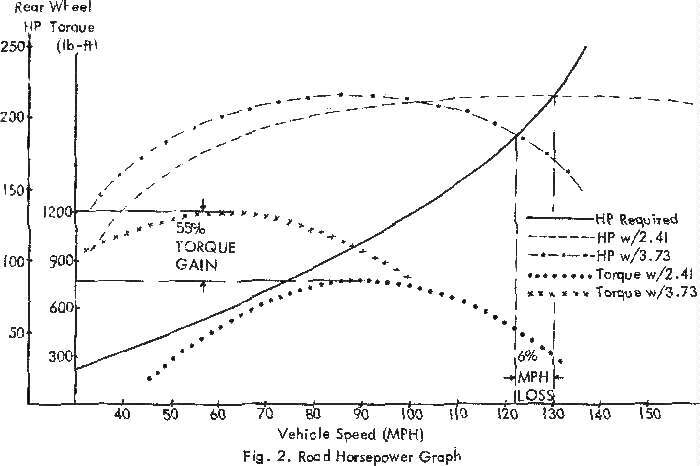 You see five curves on the graph, two torque at rear wheel curves (for 2.41:1 and 3.73:1 ratios), two horsepower at rear wheel curves (for 2.41:1 and 3.73:1 ratios), and one horsepower required to maintain road speed curve. The two rear wheel torque curves show that increasing the gear ratio both causes the torque peak to occur at a lower road speed and increases the peak torque value. This is the primary explanation for the performance increase. The two rear wheel horsepower curves show that increasing the gear ratio causes the horsepower peak to occur at a lower road speed but the peak horsepower value is the same. The single "horsepower required" curve indicates the amount of horsepower required to maintain vehicle speed. The respective maximum vehicle speeds are indicated where the rear wheel horsepower curves intersect the "horsepower required" curve. Taken as a whole, the graph shows that a torque increase of 55% can be had while reducing maximum vehicle speed by only 8 mph,only a 6 % loss. Figure 3 is a fuel economy versus 0-10 second acceleration distance (performance) graph, from it you can see that changing the rear gear ratio for performance does not necessarily decrease fuel economy In fact, there may be a gain in fuel economy for a moderate ratio increase which approaches the optimum point on the curve. Another possibility is an increase in performance with no gain or loss in fuel economy, this is accomplished by selecting a ratio that lies directly horizontal of the original ratio on the curve. Figure 4 is an emission per mile versus 0-10 second acceleration distance (performance) graph. While the grams/mile emissions figures are affected by a rear gear change, idle and no load tests, of course, are not. A moderate change in rear gear ratio will have a small effect, but a large change will have a larger effect on emissions per mile.